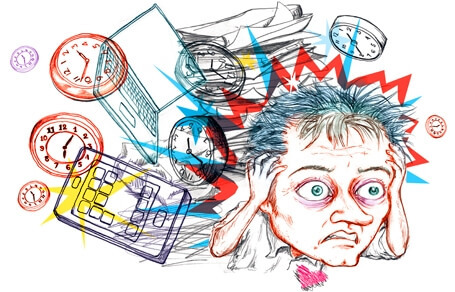 What Are The Consequences Of Stress? Most researchers and practitioners agree that there are four components of the consequences of stress says Psychotherapist Ravi Samuel. What are these- let’s find out. A major physiological consequence is hypertension. What is hypertension? It is nothing but high blood pressure. Hypertension denotes the condition when the blood pressure is consistently higher than normal. Complications due to high BP include erosion of end organs such as the kidneys, heart, brain and eyes. It can lead to heart attack, thickening of the heart muscles, heart failure or heart enlargement, stroke, renal failure, poor vision, etc… The physiological consequences of stress are not limited to hypertension or cardiac conditions. Another major effect is on the immune system. Recent findings reveal that the immune system is ultimately under behavioural control. Effects of stress and diabetes- find out! Emotions refer to the feeling aspect of behaviour such as mild irritation, rage, despair, sadness, love and liking. Whereas the physiological effects of stress can be clearly pinpointed, observed and measured, emotional changes are highly subjective. Often a person may be seething with anger within, but maintains a cool exterior, clearly indicating that emotions are not always observable. Stress may do considerable damage to a person internally, but there are external manifestations too. The most important and probably the most relevant for the manager is how stress affects the ways in which behave, the effects on their interpersonal behaviour. There are at least three important areas of inter-personal behaviour which are affected; relationships within the family, relationships with peers and relationships with other people. What is anger management? Read here. Greater attention paid to negative aspects of life and work. Inability to concentrate due to constant worry and anxiety. Overemphasis on self rather than on task. Problems in retrieval/recall from memory. This can be achieved in a variety of ways. One does not have recourse to yoga asanas or go in for a professional massage. There are easier and more practical methods. Depending on one’s taste listening to music or watching television can be great muscle and mind relaxant. Going for long walking can reduce the physiological effects of stress. Also if one is experiencing a stressful life event walking can enable the person to unwind and focus on solutions rather than on the problems. Exercising will reduce the physiological effects of the stress on the body like walking. As far as possible do not take work home from the office and try to spend time with the family. A family outing and spending time TALKING to each other would enable to understand and also help to share their difficulties. This involves doing something that one wants although it may not gel with the other family members. Eg. Buying things for themselves, going on holidays, having a relaxing bath or even reading a novel. Make out a ‘to do’ list every day. Turn your waiting time into working time. Set a fixed time for meeting people. Stress has become part of our lives, the best one can do is reduce it by way of having a balanced approach to work, family, money and accomplishments. Ultimately money and fame cannot bring happiness it is what we do with it. At the end of the day we can have only one meal, sleep in only one bedroom in only one cot!